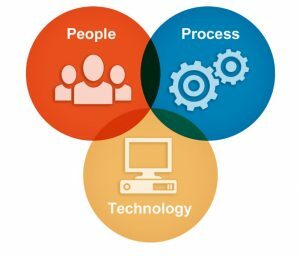 I first learnt about ‘People-Process-Technology’ in the late ’80’s early in my management consulting career. Perhaps the reason I was trained on it, I found it a useful lens for framing how to improve businesses. 25 years later, it is still valid and in use, and over the last couple of weeks it has been back front and center in my work. Industries such as electronics and automobiles have reached an amazing place in terms of their shift in the balance between, the integration, and sophistication of these three properties. Few people are required to assemble an automobile, those involved being highly-skilled workers bringing a powerful brain to tasks where automation and technology cannot yet reach. They are part of a high quality, consistently repeatable process, using dynamically configurable production lines and powerful automation with awareness of the whole system, not just them self. A high state of people, process, and technology producing excellent product. The same applies to most industries today. Competition and the customer’s demand for better and cheaper drive companies to continually improve their people, process, and technologies to more quickly deliver the highest quality product at the best cost, and ensure that product will provide the customer the outcome they value. The product I’ve been looking at recently is the management consulting product – strategies, charters, policies, and similar – for an article on consulting. The article is about the consulting process and how immature it remains – when using the term in a maturity model sense. Whereas most industries are at levels 3, 4 and 5, management consulting is at 1 and 2 on the maturity model curve. In terms of what needs to happen, when, and how, to conduct a client diagnostic, future state definition, gap analysis, strategy development and action planning, management consulting remains an artisan industry. 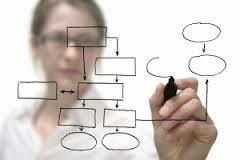 Studying the consulting process, the People-Process-Technology model reappeared. That’s when it struck us that management consulting is still 90% people, 5% process, 5% technology. While we can debate the exact ratios the point will remain the same, that technology in consulting – Microsoft Office, MS Project, and Survey Monkey – is 1980’s era capability (in a bright, easy to use, SaaS format.) And beyond flowcharts in sales decks and a few staff training materials, detailed management consulting process documentation is ‘as common as hen’s teeth’. Consulting is still about the consultant. That brilliant, intelligent, gifted, creative, interpersonal, caring, wise and experienced human that will deliver their client the best product every time. The same consultant who will advise their client once they have determined which market they need to own and the brains in R&D have come up with the market game-changer, that the only way to get it to the customer consistently on time, error-free, at least cost, and ready to use, is through process excellence. Process excellence that means finding all the ways to remove human’s foibles from the process. Humans forget things, they can only hold so much in their brain, they don’t do the same thing twice, they make mistakes, they hide those mistakes, they deviate from the path because they think they know better. Keep the human for the steps in the process where the human brain and body is required. Otherwise get them out or equip them with the knowledge, tools, and guides to do it right every time. That is the opportunity in management consulting. The value is evident in every other industry. Given the impact management consultants have on organizations and subsequently our economy, it is a win-win opportunity. It took the healthcare industry over 20 years to catch on to what automotive and electronics industries figured out in the ’80’s; that it is possible to enable the human expert with good process and produce better outcomes. When will the management consulting industry see that potential? I’m proud of the consulting firms using SchellingPoint to improve their consulting product, walking their own talk and adjusting their people-process-technology mix to bring their clients better outcomes.